The Company Logo Designer, our software to design logos quickly and inexpensively is now available as version 2.10. There’s only one things that can be said about the new version: Faster. Especially for complex logos you’ll note the difference because they’re now drawn 3x faster. More info about the program can be found on the product page of Company Logo Designer. We’ve released the Pro Trial of our Logo Design Software “Company Logo Designer”. This trial version makes it even easier for your to design your perfect logo. In contrast to the 50 templates of the normal trial it includes the 200 logos of the free logo packs PLUS another 200 logo templates that are normally only included in the Comfort Edition. 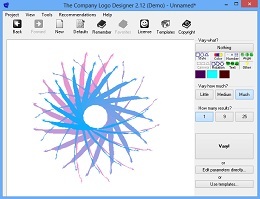 We’ve just released version 2.05 of Company Logo Designer. The new release makes it easier to use the templates and to edit the logo colors. Please have a look at the new version if you want to design your logo. Last day of our special! This is the last day of our 60% DISCOUNT special for Company Logo Designer. So, if you want to design your own company logo with a few mouseclicks, NOW is definitily the right time to start designing. Posted in Company Logo Designer | Comments Off on Last day of our special! For all the techies out there, we have a nice bit: Our technology logo pack. It’s a free add-on for the Company Logo Designer our simple-to-use tool to create your own custom logos. This Logo Pack with 25 technology-style logos is completely free and can even be used with the Demo Version of the CompanyLogoDesigner. You can download the logo pack here. The Company Logo Designer is also availble for download. The Company Logo Designer makes it easy to design a logo, but for a professional logo, a template is always a good starting point. We’re giving you 25 free templates. No purchase or registration required, just download and install. All templates can be modified, not only in color, but also the logo itself. You can download the Logo pack here. The Company Logo Designer main program download ist here. When working with the Company Logo Designer software, template files can be a great timesaver and give you an impression what logo types the program can design. Download the logo pack here.